Types of prefabricated roof trusses. time-consuming process. Of the pitched roofs, the gable roof is the simplest to construct, especially with the use of lightweight roof trusses (Fig. 48). 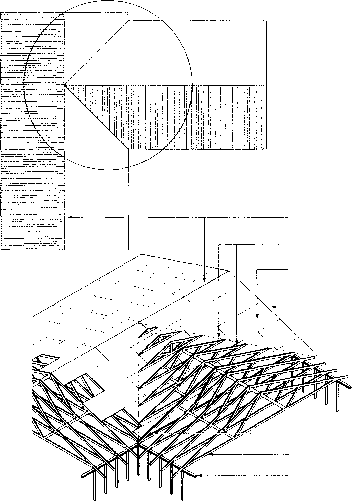 Other configurations, such as the hip roof and L-shape roof, though more complex, can also be framed with trusses (Fig. 49). 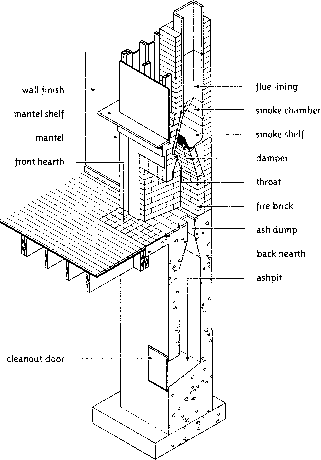 of the attic space is easily accomplished through the eaves or gables or both, and at or along the ridge. In most cases, trusses are designed to span from exterior wall to exterior wall with no intermediate loadbearing walls to support the roof loads (Fig. 50). Thus, the entire house may be used as one large workroom during construction. This increases the flexibility of interior planning, because partitions can be placed without regard to structural requirements. Additional flexibility and speed is gained with pre-assembled components and add-on features such as garage roof trusses, porch roofs, simulated mansards and window canopies, which can also be supplied by the truss manufacturer. Metal-plate-connected trusses can be delivered to the construction site and placed on a flat, clean portion of the site. Trusses under a 20 ft. (6 m) span are usually installed by hand. Trusses longer than 20 ft. (6 m) require special lifting techniques to avoid damage. The trusses must be lifted into position with care to prevent excessive lateral bending. The first to be put in place is the gable truss, which is braced to the ground and wall. Each additional truss is lifted into position, generally 24 in. (600 mm) on centre, toenailed to the top plates and temporarily braced (Fig. 51). When all trusses are plumbed and properly positioned, they are braced permanently (Fig. 52). The stiffness of the roof is increased after the sheathing has been applied. For on-site construction, the simplest roof is the gable roof (Fig 53A). 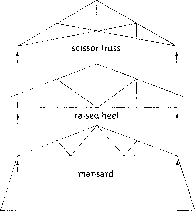 All rafters are cut to the same length and pattern, and erection is straightforward. A variation of the gable roof may include dormers for additional light, head room and ventilation (Fig. 53B and Fig. 53C). However, openable windows and fixed skylights that can be fitted on a slope between rafters will provide ventilation and light without the complexity and cost of framing a dormer. 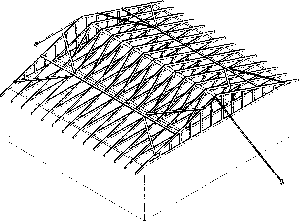 In the hip roof design, shown in Figure 53D, common rafters are fastened to the ridge board while hip rafters supply the support for the jack rafters. 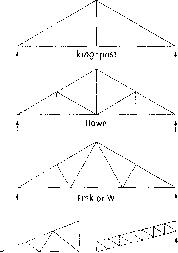 Permanent bracing of roof trusses: (A) permanent bracing of top chord plane; (B) and (C) permanent lateral bracing to web member or bottom chord plane. See isometric below t-shape trussed roof. Note: For clarity, some structural members of some of the trusses have been omitted, and roof sheathing appears continuous. The dimensions of roof joists and rafters for the various grades and species of lumber and for the different live loads encountered are given in Tables 29 to 32. How to build a ridge roof and valley jack rafters?